This week is our week on the Glorious Autumn Block Party and I share the week with Sandi and Faith and many wonderful sponsors. Please make sure you take the time to visit each of our sites on our perspective days. This is the second baby quilt we have done using a bee fabric. The first one had a pattern, this one is random squares Some of the fabric is the same as in the other quilt. We used a yellow flannel for the back. I did echo quilting following the rows. The binding is out of the same striped fabric that is in a few squares. Glorious Autumn Block Party With Prizes! Today we would like to share my block Richard's Star. Richard is a fan of star's and created this using the quilting program Electronic Quilt 7 or EQ7 for short. When I created this pattern, I wasn't quite thinking it would involve such small blocks. As it turns out, the 9 patch in the center is under 2 inches per block and my hands are a tad big. My wife (Tanya) laughed at me working on my little blocks and she told me that maybe I should have made my block a little bigger. If you spend any time poking around Richard and Tanya's quilts, we try to have a little fun. So what did I do? I went bigger. I made it a little bigger. Its hard to tell the perspective on this with just the single block, but the above block is a 45 inches by 45 inches. To put the blocks into some perspective, I had my daughter Rebecca hold them up together. Now I don't suggest that every one do it this way, but with my wife laughing at me about my small block I could not resist going big! I have created a PDF with instructions on my star and also give you a easier version if you want to save yourself from all the little tiny piecing in the middle. Please download my PDF and if you make one of my stars don't forget to link up at on the flicker group. It is now time for prizes. Regardless if you make my block or not, if you put a comment on this post you will be entered into a drawing to win a charm pack "French General Favorites" from Fat Quarter Shop one of my sponsors. If you need a idea to talk about, Tanya would love to know your favorite fall activity and she promises to answer every comment personally! (I will also) This drawing is open until Tuesday, November 6th. 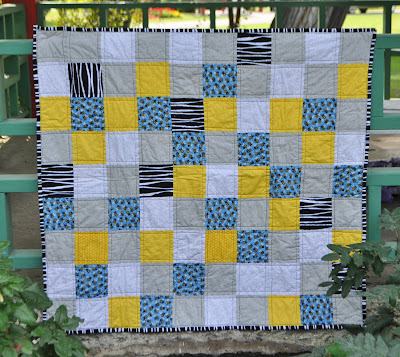 This baby quilt is a simple square block quilted by echoing the lines and rows. It is made out of Amelia by Me and My Sisters. This is one of Tanya's favorite designers. She has made multiple quilts out of this and Twirl which is another line of fabric from the same designers. We took this quilt to the International Peace Garden to get some cute pictures. This week is our week on the Glorious Autumn Block Party and I share the week with Sandi and Faith and many wonderful sponsors. Please make sure you take the time to visit each of our sites on our perspective days. 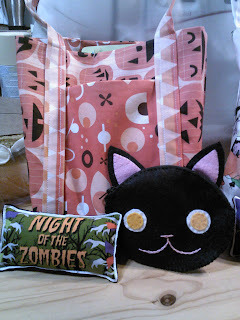 Did I mention that I am having a giveaway on my day? Well it must be time for Halloween. Yesterday Rebecca brought me her vampire pumpkin. I had to ask her to translate as I did not understand. The top says Vamp and the things in the middle are Eyes! Like I was suppose to understand it. Tonight Jared came upstairs wearing this. Mom (Tanya) has been busy for the first time sewing/modifying a costume (she says second, something about gluing a costume together). This is a first for us modifying instead of buying a costume. For those that are lost, Jared is going as a creeper for Halloween. Creepers are monsters in a 8 bit graphic game called Minecraft. Jared is holding a Creeper we won in a give away many months back. Tanya is not yet finished with the costume, she still needs to sew the 2nd set of legs on, he was just modeling it to see if I could tell what he was. Julia decided she would get into the Halloween costume thing, can we say Oscar the Grouch? Or dirty laundry. She is getting to be a busy child, 7 months old today and she thinks she can stand up on her own. It won't be long until she is walking I think. She still only commando crawls, but she moves fast now. Nothing is safe any more, the vacuum is now self propelled. It is now time for Link A Finish Friday. Today I would like to start with a big thank you to Fat Quarter Shop who has offered to Sponsor our Link A Finish Friday with Prizes. 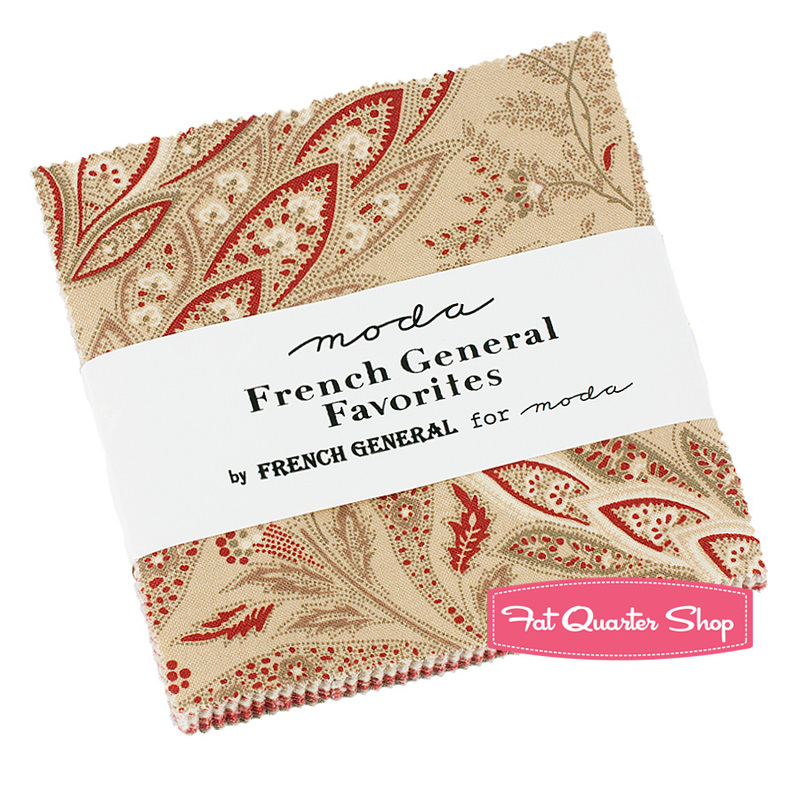 This month's winner (October) will win a $15 gift certificate to spend on Fat Quarter Shop. Don't forget to stop by that day and check out the block I am sharing. And did I mention Prizes? Oh ya Prizes! Tanya has been showing off this week. She has made not 1, not 2, but 3 rag quilts. While they are not completed. They are sewn together, but only one has been cut. I have been busy the last few days programming and have not spent enough quality time quilting this week, so I think she is trying to make up for it. Each of these quilts are different, Some of them big, some of them little. But each of them cute, because each of them were created by my wonderful wife. Now I guess I need to stop talking and start sewing. Block Party and your invited! I am not sure if you have been following along or not (If you have not you should!) 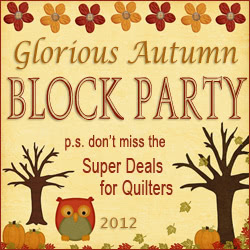 Quilting Gallery has and is hosting a block party 3 days a week starting September 4th 2012 and ending December 13th 2012. The best of all the dates will be a week from Tuesday October 30th. And why might you ask? Well that is my day. 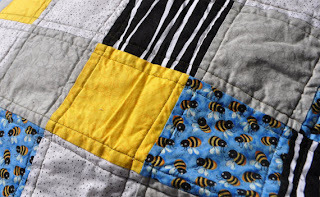 Yes Richard and Tanya quilts is participating in this blog hop. This is my first blog hop and I hope to be involved in many more. I hope you will all be back a week from Tuesday to join me. I feel like a slacker as its been a few weeks since I had a more interesting post. One thing I realized is some where along the way I ended up showing the finishes, but not the beginnings or the process along the way. 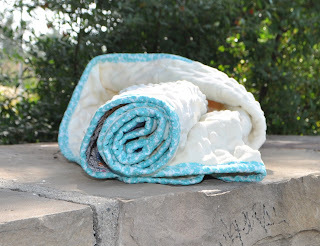 Last week we sold yet another Rag Quilt from our Etsy store. I have as of yet only sold 4 of my quilts on Etsy, but all that I have sold were my Rag Quilts. Tanya recently has made 2 complete rag quilts from beginning to end, so with the money we got from the last couple sells we bought a bunch of new flannel. Above you can see 6 inch by width of fabric that I cut for my wife Tanya. She is is slower at cutting when its full yardage, so the other night I sat down and watched 2 TV shows and cut these all into strips. Just before I came up to make this post, Tanya has completed yet another top (she still needs to cut it) and if she remembers we should have it on the site some time later this week. A week and half back I went to a SLMQG Mixer for Sewing Summit and I actually won one of the drawings it was a Jelly Roll And if I can remember I will try to get a picture (or maybe show you what I am going to make out of it). At the same even in the Door Prizes I got a pile of cute fabric and charm pact and mini charm. Which of course I have not taken pictures of. While thinking about all this not taking picture, I again came into yet another trove of material. At our meeting last week one of the members had some material that they were not going to use and wanted to give it too any one that was willing to use it. And you know me. This is just a small amount of what they gave out, but when I saw it (and another quilt that some one showed off at the guild meeting) I knew what I was going to make. Many months back you might remember that I went though a craze of Granny Squares. Well it has happened again. I am making them with this fabric. I am doing them a little different this time. 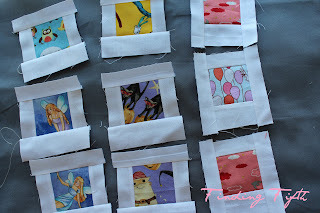 I am doing a strip version of them rather then cutting all the material up to 2 1/2 squares first and sewing them back. I hope I can make a large lap quilt out of this, since all of the material is scraps and I have no clue how much I go, it will be interesting to see how far it goes. I have about 2 yards of a single print that I will use on the back and these on the front. Any way I have bounced though 5 different projects in the last week with out completing one, so today is just a random musings day I guess. Again don't forget to come back a week from Tuesday. (Did I remember to point out I will have a giveaway that day too?) Any way hope your week is wonderful. Last Friday I mentioned that I got frustrated quilting my Diamond Quilt. Tanya was unpicking the binding when I got home from work on Wednesday and it is now sitting back on the pile of quilts to quilt or bind (I think I have 9 in the pile and Tanya is telling me I need to get some moving along, as she ran out of pins to baste). So look forward to more new quilts sooner than later. Yesterday I posted my Halloween Quilt. I could expect to see a few more Halloween items showing up over the next few weeks. Here at the Healey Home we are working hard on the Christmas list and plan to have all of the gifts done on time which means less time slacking and more time quilting. Last week It's About Time!! above and Say "Wonky!" were the 2 most visited links. Remember the most important part of LAFF is to share the love. Meaning Please visit and comment on the blogs that link up. Encourage and let them know you love their quilts and other projects. It is getting close to time that I too will have to do a Swoon, but it is not today. Back to the sewing room for me and please link up to you. I am slowly getting in the mood for the season! Two days ago was National Boss Day. To celebrate, my coworkers and I decided to do something special for the boss. We filled his office up with pumpkins. A full pickup truck full. My boss is a pretty cool guy and has a great sense of humor. A couple years back we filled his office up with packing peanuts to the 3 foot level. A few years before that we Shrink wrapped his entire office with a full roll of industrial packing wrap. Needless to say, we try to keep things fun at work. And some times the boss just sits and shakes his head and wonders what we have planned next. Since I was all in a Pumpkin Mood, I brought 5 large ones home with me, so expect to see them carved some where down the road. I decided it was about time I finished this Halloween decoration. Its hard to tell how big it is, but its pretty decent size I think it was one yard by width of fabric. My son James is scoping out the house trying to decide where to hang it and has pointed out the large front window would be perfect for it. This was a one yard cut and all I did is some simple quilting around boxes and the strings from the spider I sewed down them too. I circled all the ghosts and witches and all the purple boxes. I would guess over the next few years each time I pull it out, I will sew it just a little more until its quilted more fully. Additional borders were added to this 25 square rainbow quilt top to make it a little larger. Most likely this quilt will go to Richard's Mom, for Christmas. It is basted and ready for quilting. The purple and pink quilt top from the Beginner QAL is finished. Richard sewed the two outside borders on it and everything else was completed by me. I still need to finish Richard's two that he started and start another for Rebecca for Christmas. He does much better at all one type of block, than a slow based sampler. It is basted and ready for quilting. It is also a Christmas gift, for my sister. The plus quilt is about half way done with quilting. We decided that it is going to be part of James' (17 yr old) Christmas present, good thing he never reads our blog. Richard was trying to decide what color of thread to use on this quilt and was having a hard time deciding, so I helped him out and told him to use a variegated thread we had on hand. This pile of fabric is for the pinwheel quilt for my Mom. We found a block that is made of half square triangles, so no weird angles. We are going to do half of the blocks in tan and half in the light green. The plan is for me to start cutting it this weekend, if not sooner. This blue train rag quilt has been sewn, but not cut yet. It is for a baby shower on Saturday, unless it doesn't get done and I end up using one out of our Etsy store. This bright rag quilt with blue, yellow, green, and lizards is for another Nephews Christmas gift. I have three of nine rows done. He is four and likes all thing creepy and crawly.﻿ Some have asked why so many rag quilts. They are easy and something I dare do. They are also what we have sold in our Etsy store. I am comfortable with beginning piecing, but not yet up to quilting a top. I have to give Richard time to catch up on the quilting. This is a Halloween panel that Richard was having fun trying out different stitches on his machine. He still needs to bind it, so we can hang it on our wall, before Halloween in over. The ghastly quilt for my other sister is on temporary hold, because I ran out of pins to baste with. The zig zag quilt Richard is mad at, is patiently waiting for me to unpick the binding and prepare a new one. I think about every free moment between now and December 24th is going to be spent sewing, to try to get these and the other planned quilts/gifts ready. Almost a year ago when I first started quilting I had tons of people tell me about this Men's Quilt contest in October. I have been looking forward to today all year long. 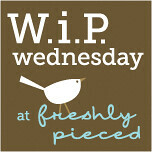 Originally it was supposed to be much bigger thing with a contest and prizes then it was downgraded to just a linkup. 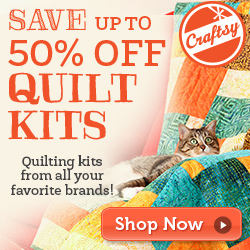 I though want to say I am a Man that Quilts and I was so excited about this. Then when it was changed from a contest to a link up I was disappointed, because I wanted to win. How do you win a linkup any way? A month and a half back the SLMQG had a contest using Dresden's. When I made that quilt I also started on this quilt. 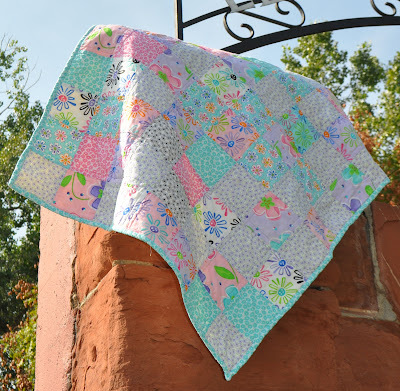 The quilt I made for that contest was A Snake in the Garden. This quilt is going to go to my son Jared for Christmas (Shhh don't tell him, That is Jared by the way holding the quilt). 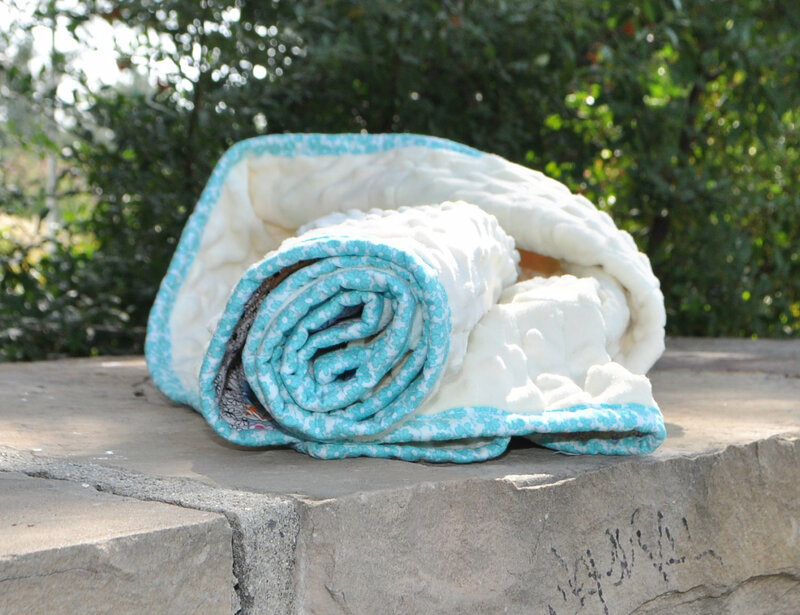 For those that are new to Richard and Tanya Quilts. We are new to the quilting game. I made my first test quilt Christmas Eve last year and have finished 53 quilts now (wait this would be 54). My goal is to make 52 quilts in the 52 weeks this year, I guess I have exceeded my goal. 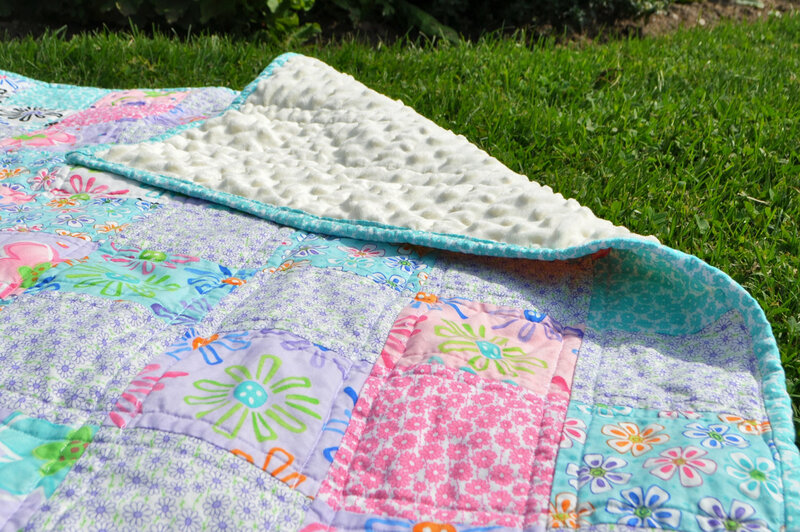 Please note that most of my quilts are baby or lap quilts, but I love each and every one of them. Tanya, my wife is slowly catching up to me on the quilting game. Last night she finished her 3rd quilt (ok really slow) but she will catch up one day. We are having a lot of fun quilting as a family. My 14 year old daughter is now working on her 3rd quilt. Her first is finished already and she is half done quilting the 2nd and just finished the top of her 3rd (in a sewing class at school this year). If you are new to Richard and Tanya Quilts I hope that you follow us and see what we continue to do. To view a few of the quilts I have finished visit my Finishes page here. I would also encourage you to visit each Friday to participate in my Link A Finish Friday with prizes. Stop by the 30th of this month where I will be a featured designer in the Glorious Autumn Block Party and I will also be doing a giveaway that day too.